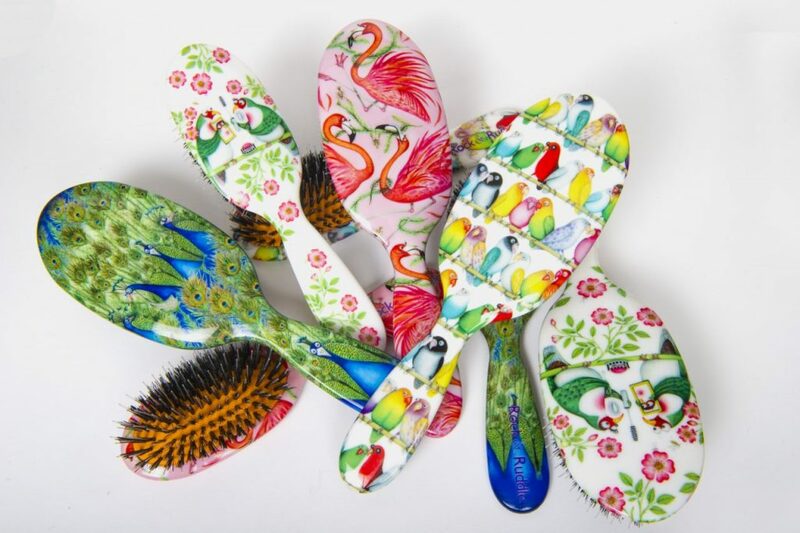 Rock & Ruddle has always strived to combine a top quality natural bristle hairbrush with really fun and beautiful art. This Spring Jackie and Alexandra have been delighted to launch a really exciting range of hairbrushes which they have called “The Feathered Friends”. This quartet of hairbrushes feature gorgeous bird designs including flamingoes, lovebirds, peacocks and a duo of Jambu Fruit Doves “Making Up”. Once again a collaboration with artist Clare Mackie has enabled Rock & Ruddle to offer these unique and gorgeous brushes to customers around the world. Clare has incredible and enviable talent creating beautiful and whimsical characters and designs in all her work. The “Feathered Friends” collection has been inspired by Clare Mackie and Polly Pullar’s illustrated book “A Winged Collective.” This treasure of a book features descriptions of collective nouns for birds as well as Clare’s illustrations. We wholeheartedly agree with Mark Hedges in his foreword to the book: “Together Clare and Polly have cooked up a storm of hilarity and detail: not only are you going to have a book to treasure visually, but also one to learn from”. Jackie and Alexandra have learned that their brushes feature a flamboyance of flamingoes, a cleaving of lovebirds and an ostentation of peacocks! Wonderful! Beautiful brushes and fascinating books….is there a collective noun for this?